This Post is written in english, since this event will be held in english. Intervaltraining is an essential aspect of training programs that supplement strength training. And the design and periodization of Intervaltraining is definitely one of the most underrated and overlooked aspects of personal training. Trainers and Coaches need to respect Intervaltraining more and they need to start to program and periodize on a level similar than strengthtraining to get the best results with their clients and athletes from the Intervaltraining. At the YPSI we use different types of Intervaltraining depending on the status and goals of our clients and athletes. – The primary training effect and the advantages of specific exercise variations in MST – High or low handle on the prowler, bent and extended arms on the prowler, pulling a sled backwards or forward, etc. – Training for a Half-Marathon, Marathon & Triathlon – a perspective on maximizing training output & efficiency. – Supplementation specific to Intervaltraining – Which supplements are the best and most useful for Intervaltraining? 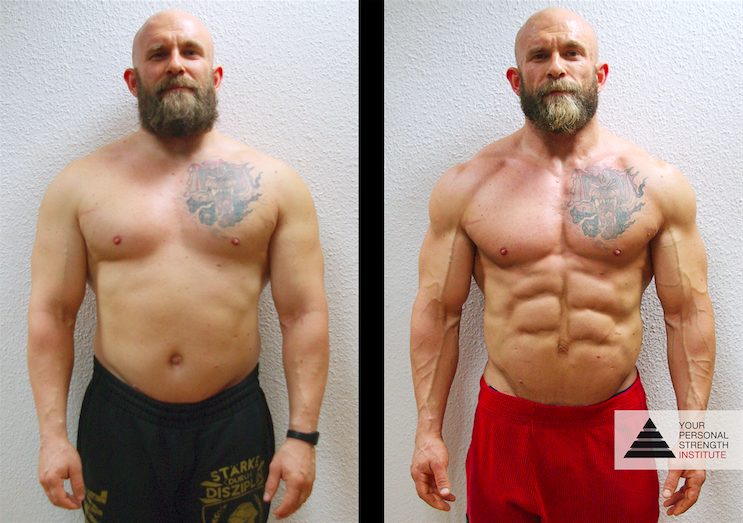 Picture: Sven Knebel did four strength training sessions plus up to 6 intervaltraining sessions per week during his 18 week transformation.